I didn't really want a prequel series to the Harry Potter franchise. I didn't think one was necessary. The Harry Potter books, as well as the films adapted from them, do terrific jobs in creating a magical and exciting world filled with rich characters and powerful stories. Sure, the films themselves fluctuate in quality - Prisoner of Azkaban is all kinds of brilliant and The Philosopher's Stone is a bit of a mess - but as a franchise it's about as close to perfect as cinema can be. Children grew up with the characters on screen while parents watched as their own kids found identities within the stories the films told. It is the franchise of a lifetime and, frankly, I feel privileged to have grown up alongside it. When Fantastic Beasts and Where to Find Them was announced, I groaned. Why, I asked, why do we need more films to fill in a world that was already so perfectly fleshed out? Why can't a franchise just end, and actually stop producing content to allow a genuine air of finality? I was frustrated, to say the least. Yet, here we are. Fantastic Beasts is far from a great film for a number of reasons, but it has one key strength that allows it to feel justified even in its messy quality: world-building. The slow pace can be frustrating, there are too many characters, and perspective is a frequent issue, but Fantastic Beasts brings us back to the wizarding world itself so effectively that I suddenly don't feel annoyed by its existence - which, frankly, is more than I ever expected from it. 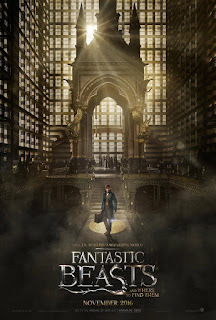 Newt Scamander (Eddie Redmayne, as brilliant as ever) is an English wizard who is journeying to New York, but when he arrives his magical briefcase faces some issues and the plethora of creatures inside it escape, roaming free in the Muggle (here called No Maj's) world. He soon forms a little group with three people he meets after the accident: Tina (Katherine Waterston, decent), an under-appreciated witch employed by the Magical Congress; Kowalski (Dan Fogler, funny if occasionally annoying), a no-maj who just happens to get caught up in everything; and Queenie (Alison Sudol, effortlessly brilliant), Tina's sister who can read people's minds. The four of them race to get the magical creatures back into Newt's briefcase before they can be seen by anyone unfamiliar with witches and wizards, all while a seemingly bigger case of dark magic is plaguing the city. One of the best things about Fantastic Beasts is that its story is immediately distinguishable from the Harry Potter series. There are no kids here, no schools and no world famous bad guy hunting down the lead protagonist. It feels different from the offset. Different, though, doesn't always mean good. In this case, the entirely new tone offers mixed results. It's refreshing to see a spin-off series of a popular franchise tackle something so different (Rogue One is likely to soar in the opposite direction later this year), and JK Rowling handles her screenwriting debut nicely. She has a nice grasp on her characters and, once things eventually get moving, she creates an interesting narrative. The issue is that we as viewers physically cannot help but look at this as a Harry Potter spin-off, and what's one of that franchise's biggest sells? It follows a group of kids on a journey. Amid all the magic and spectacle, Harry Potter is a coming-of-age narrative. When Harry, Ron and Hermione first see the Great Hall, their faces light up. When they first experience a Quidditch broom leaping into their hands, they gaze in wonder and awe. In Fantastic Beasts, when we get our first real glimpse at something magical, Newt scarcely looks twice at it. It feels kind of diminishing. We want to be amazed too, but when our protagonist isn't fussed by something, that feeling passes through the screen. The Philosopher's Stone is consistently amazed by everything it displays for us, but Fantastic Beasts is too interested in setting up a new franchise and rebuilding a world that it frequently forgets to have a bit of fun and show a little personality. The most frustrating thing about this is that the film has even brought in Kowalski, a character that doesn't know magic and actually is blown away by all of this, but for some reason it rarely shows any of these scenes from his perspective. Newt is a terrific character, and very easily likeable, but the film needs to push him into the backseat every now and again so that Kowalski can lead the scenes that should blow us away. When we first enter Newt's briefcase and find a whole landscape filled with magical creatures, we want to follow Kowalski's amazement, but instead we follow Newt's mere admiration for the creatures. It frequently creates a pleasant tone, but very rarely a spectacular one. The film doesn't find anything truly magical until one of its final moments, which sees a creature take to the skies above New York City, completely ditching the human characters. Finally, we get a sense of wonder and spectacle and, really, magic. It's an exhilarating scene and easily one of the film's standout moments, it's just a shame that it comes so far down the line. It's a double-edged sword, really, as the four lead characters we have here are all brilliant (especially Queenie, mostly because Sudol captures the trademark Harry Potter quirkiness so well) and I'd happily spend another four films with them. It's a real shame that they're home to the film's most frustrating element. Aside from this whopping perspective issue, there are a few other niggles. There are too many characters and subplots in the opening act which makes things feel a bit muddled and messy, there's a mostly unnecessary romance running through the middle, and the ending seems to drag on for much longer than it needs to. None of this really damages the film too much though, and we're left with something fun and engaging once it works out what it wants to be. Fantastic Beasts struggles until it finds its way into Newt's briefcase, and even if that scene doesn't entirely work, everything that follows feels re-imagined with a sense of purpose and direction. The film's subtle name-dropping does a good job of reminding us that we're in the Harry Potter universe, and seeing quirky looking characters shout spells while holding a wand is more than enough to put a gleefully nostalgic smile on my face. The set design is predictably stunning, and all of this comes together nicely to form some terrific world building. It feels like the same world as its parent series, but it also feels different - it handles the shift in location admirably. Fantastic Beasts may struggle to feel as magical as all that came before it (and the lack of a child-into-adult story may bring this burden onto the four films still to come), but it does a good enough job of justifying a return to a world that, simultaneously, everyone wanted to remain in forever yet never wanted to return to. To Summarise: It loses most of its magic due to frustrating perspective issues, but Fantastic Beasts and Where to Find Them is nonetheless an effective and mostly enjoyable return to the wizarding universe thanks to its efficient world building and a handful of wonderfully likeable characters.